Tonight I made more and more granny squares. I am trying to make 10 a day for 10 days (we shall see). I can't wait until they are all finished so I can get a better, finished picture!! ARE YOU FREAKING KIDDING ME? THOSE ARE ADORABLE!!! Where in the world did you get such cute iron ons? She's a lucky little girl to have a Mama with creative, fantastic friends! Cuuuutie patoootie janel!!! Ruby is a lucky little girly! so sweet! those iron-ons are adorable. that little girl is going to be so stylin'. yet another thing that makes you the nicest blog friend ever. are you going for sainthood?! CUTE! I like this idea. OH MY GOSH THOSE ARE ADORABLE!!! These are so cute! 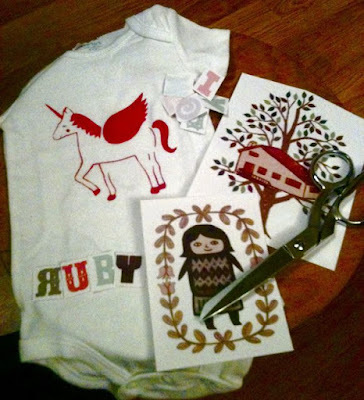 That's pretty smart- iron on designs for onesies!